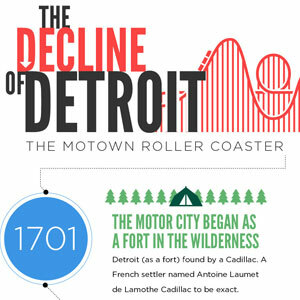 - 1701: Detroit (as a fort) found by a Cadillac. A French settler named Antoine Laumet de Lamothe Cadillac to be exact. - FACT: City is named after the Detroit River, which links Lake Huron and Lake Erie. The word "detroit" is French for "strait." - 1760: The British take the fort after victory in The Seven Years' War ... fort under siege by the Ottawa Indian chief Pontiac. - 1910 to 1950: the city was a boom town, equal to any of the gold rush towns of the American West. - FACT: In the early 1900s, Detroit was the automotive capital of the world. Henry Ford founded Ford Motor Company in 1903 while the Dodge brothers and Chrysler also did business in the city. - 1950: car makers from Chrysler to Cadillac, Studebaker to Dodge had plants in or near the city limits. - 200,000 of those 1.8 million were employed in manufacturing. Or about 1 of every 10 people in the city. - 1960: Detroit is the richest per capita city in America, according to the U.S. Census Bureau. - FACT: Along with the population boom, there was also a thriving arts and culture scene. One of the top destinations in Detroit was the Detroit Opera House. - Stoves, ships, cigars, pharmaceuticals, beer, and rail cars were also produced during the boom years. - Fewer than 20,000 of a 714,000 population work in manufacturing. Or, about 1 of every 50 people. - since the 1910 census. - Why the decline, leading to bankruptcy? - 1. 1967: Racial riots engulfed the city, but the most destructive one occurred on Sunday, July 23, 1967. A police confrontation sparked a five day riot that left 43 dead, 467 injured, 7,200 arrests, and more than 2,000 buildings destroyed. Now: Crime. 7 out of 10 crimes are unsolved. - 3. Lack of industry diversification. - 4. Globalization of the car industry. - 5. Sprawl: A Detroit never developed a subway, trolley, or intricate bus system. - 6. People mover rail system, designed to transport 12 million people, transports 2 million a year. Loss: $12 million annually. - FACT: White flight: In 1960, Detroit's population was 1.6 million: blacks were 29%, and whites were 70%. Today, blacks comprise 84% of population and whites 8%. - FACT: Now, there are just two big car factories left in Detroit, Chrysler's Jefferson North Assembly Plant and General Motors' Detroit-Hamtramck assembly plant. - FACT: The number of vacant housing units doubled in the past decade to nearly 80,000, more than one-fifth of the city's housing stock. - Population exodus: 237,000 residents, including 185,000 blacks and about 41,000 whites over past 10 years. - The Hispanic population ticked up by 1,500. - 2.7% a decade earlier. - Oakland County's African-American population rose 36% to 164,078. - 30,000: number of abandoned houses in Detroit. - There may be 70,000 buildings total, abandoned in the city. Detroit 2.0: Is rebirth possible? - Comerica Park, where the Detroit Tigers play baseball, welcomed 3 million fans last season. It is is ground zero for the city's tech scene. - Detroit's startup continues to solidify thanks to a hybrid of public and private support and an engaged community of investors and incubators. - Bizdom, the brainchild of Quicken Loans founder Dan Gilbert, a third-generation Detroiter. Gilbert is on a crusade to revitalize and rebrand the city's once-bustling downtown as a high-tech hub. - Downtown Detroit is now a hip-yet-affordable urban destination to live, work and play. - Immediate access to America's largest trading partner, Canada.